From its earliest manifestation, Second Hand Rose has embraced a visual aesthetic that involves costuming akin to Western glam rock bands dating from the 1970s and 1980s. Liang drew much attention to the band early on by wearing women’s clothing during performances, as well as wigs of long dark hair and extensive make-up. His cross-gender approach to stage dress intentionally challenged cultural norms, though he was not taking an overtly political stance about gender roles and expectations in contemporary society. In fact, he connected cross-dressing in part to Chinese opera performance traditions in which male actors portray female characters. In addition to pushing against normalized gender expectations, Long also noted that the band as a whole wanted to break away from standard “rock and roll” styles for onstage dress that he found with many of his Chinese contemporaries: black shirts, jeans, and leather jackets. The Second Hand Rose style of colorful and playful costuming during performance therefore echoes Liang’s vision for the band as an antidote to “copy cat” or recycled Western rock style, both musical and visual. 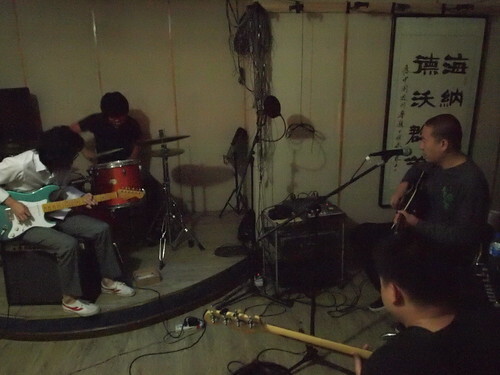 To see a video of Second Hand Rose performing at a Beijing club in 2003, navigate to this clip. A new tab will open with a YouTube clip. In recent years, Liang has relied less on cross-gender clothing on stage, but the band as a whole continues to accent their performance with unique costumes that blend cultural influences and origins. During our interview, he noted that during the last several years, boundaries between external gender markers such as hair style and clothing are blurring more and more in urban areas of China. He also stated that much has changed since he launched Second Hand Rose over a decade ago, offering as evidence his observation that early on in the band’s career audiences and critics alike would either embrace or criticize his appearance on stage in female clothing. Today, he feels that people are not so easily shocked or surprised, and he senses that this is because of the larger shifts happening in Chinese culture. Ultimately, Liang stands behind the belief that Second Hand Rose is a band that has meaningful “content” beyond idiosyncratic or contentious stage dress and that his project of blending Chinese heritage with rock music provides fans old and new with something satisfyingly original.